Introduced to the snus market by Swedish Match in 1977, under the Tre Ankare brand, portioned snus quickly exploded in popularity and is now the most popular way to use almost all snus brands. You will also find classic loose brands available in portion format, there is a wide range of different portion strengths and sizes designed to please everyone. The majority of portion snus brands have a standard portion material, but recently some brands have been releasing more innovative portions designed to improve the portion experience. An example of this is Swedish Match’s General Tailored which employs a new material called NATUFIBE. NATUFIBE promises to increase comfort in the lip as well as minimize drip, and is in my experience definitely one of the best materials used today. Most portion snus comes in both original and white format, keep in mind that they are very different. Aside from nicotine strength, the major difference in portion snus brands is that they are available in original or white portion format (some snus brands such as Ettan are available in both formats), and this can make quite a difference in your snus experience. It is therefore important to understand the differences between the two formats. Original portion snus comes pre moistened in the cans, and this allows nicotine to be released into the bloodstream rather quickly. With a rapid nicotine release, users can feel a buzz within a minute or two of putting in a portion, and the flavors of original snus generally tend to be the strongest within the first ten minutes. The quick onset of a buzz can mimic the buzz from smoking a cigarette, and this can be good in certain situations (such as in the morning alongside a nice coffee). However, due to the rapid release of flavor and nicotine, original snus often doesn’t last as long as white portions do, and they start to drip sooner. White portions on the other hand are much drier, and thus take between five to ten minutes before they are moist enough so that a nicotine buzz and flavors can be felt. Coming on slowly, the buzz from white snus tends to last longer, but is usually not as intense as what an original snus pouch can provide. The flavors also take longer to develop, and this can have the added benefit of creating more complex tastes which slowly transition from one style to another. White portion snus tends to be great for relaxing activities (such as reading) where you want a milder but longer lasting buzz as well as a complex taste. Wanna know more about our bestselling products? 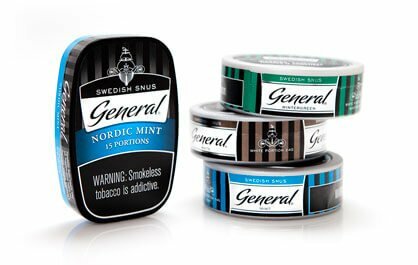 Check out our list of best Swedish snus.